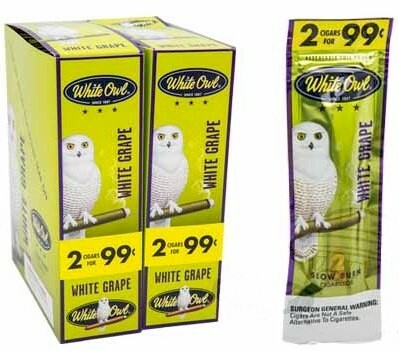 White Owl White Grape 2 for 99¢ Cigarillos Cigars are perfect to be shared with friends over a drink at a bar. The aromatic smoke enlivens your spirit and makes every celebration more memorable. The White Owl White Grape 2 for 99¢ Cigarillos contain a well-balanced blend of tobaccos from five different countries and are infused with subtle notes of white grape. You can pair the White Owl White Grape 2 for 99¢ Cigarillos with a glass of red wine to enjoy an enhanced sweetness and richness. The cigarillos are rolled with a homogenized sheet wrapper and binder which offer you a consistent flavor, every time you light one up. Come packaged in 30 packs of 2, in foil fresh pouches for guaranteed freshness.